View Cart "100 levs, 2015, Bulgarian Iconography, St. Mina" was successfully added to your cart. The obverse of the coin features the logo of the Bulgarian National Bank and the year ‘1879’ inscribed on the ribbon. 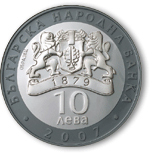 ‘БЪЛГАРСКА НАРОДНА БАНКА’ (the Bulgarian National Bank), the nominal value ‘2 ЛЕВА’ (BGN 2) and the year of issue ‘2012’ are inscribed in circumference. The reverse of the coin depicts an image of the poet Dimcho Debelyanov, the opening verse ‘Да се завърнеш в бащината къща…’ (Going bacк to your father’s house…) on the right and the inscription ‘125 ГОДИНИ ОТ РОЖДЕНИЕТО НА ДИМЧО ДЕБЕЛЯНОВ’ (125 Years since the Birth of Dimcho Debelyanov).